← I say it; they draw it! Last week Apple introduced iOS 8 and, along with it, a reconfiguring of iCloud document storage. Moving from the old, sandboxed system in which apps had access only to their own documents stored in iCloud, iOS 8 brought iCloud Drive, which allows apps to open documents in iCloud from other apps. This has been a long time coming, but there is a hitch in the transition. It’s this: when you activate iCloud Drive, all of your iCloud documents are moved into the new storage system. That means, sadly, that apps using the old Documents in the Cloud method of accessing iCloud documents won’t see any of the iCloud Drive files. This includes all apps on Macs that aren’t running a version of OS X that supports iCloud Drive. Such as Mavericks (OS X 10.9)—the most current Mac OS that Apple has released. iCloud Drive capability is coming with OS X 10.10 (“Yosemite”) sometime next month. Fortunately, Apple has made iCloud Drive optional in iOS 8, though the iOS 8 Setup Assistant really tries to convince you otherwise: if you decline to make the transition, the Assistant makes you confirm your Luddite ways. Much less fortunately, the iWork for iCloud apps that run in a modern browser do not make iCloud Drive optional: it’s either activate iCloud Drive (which affects all of your iCloud documents on all of your devices) or no iWork for iCloud for you—click “Not Now” and you are booted out of the iWork for iCloud app! 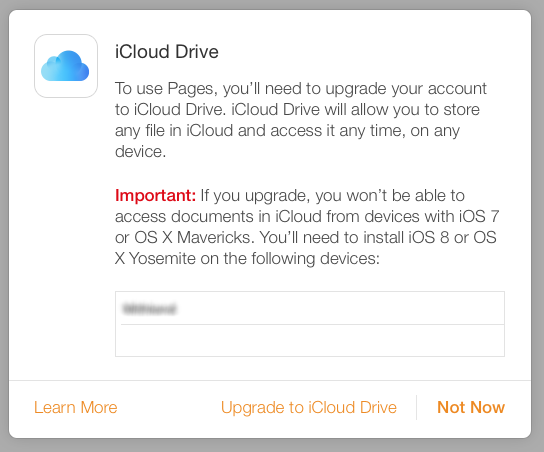 If you click “Upgrade to iCloud Drive” the consequences can be severe: if you are not running the Yosemite beta on your Mac, and if any of your Apple devices are not updated to iOS 8, they all lose access to your iWork documents stored in iCloud. 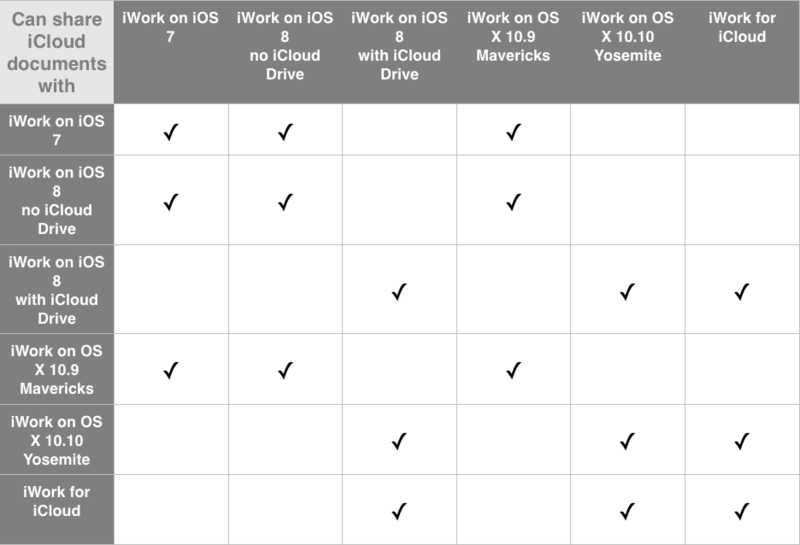 The current matrix of iCloud document accessibility — not even Neo could understand this! This entry was posted in Opinion, Technology. Bookmark the permalink. I suspect it is worse than you thought. I created a document in Pages/iOS8 (no iCD) and the file flatly refuses to download to Pages on my Mac (Mavericks, no iCD). I can see the file in Finder, but it just stays at 0 bytes. Can’t even load it in the browser version unless I activate iCD – which you can’t actually do in Mavericks. Oh well, time to convert to that OTHER word processing format and transfer it via Dropbox. Apple never did get syncing right. it will be a long time before I trust them the way I trust Dropbox.